10:54 - Seth Colter Walls: Brit Hume: McCain had a "peculiar" expression on his face while listening to Obama. "I don't know," he says to Krauthammer, who agrees that Obama is a man of "remarkable self-containment." 10:51 - Sam Stein: A few notes here. Without a transcript in front of me, it appears that Bob Schieffer gave John McCain the final word on seven of the eight questions. Moreover, I don't recall McCain mentioning the middle class once - an omission that is significant as much because he has been attacked by Obama on this front, as it is because it represents a failure to relate to the majority of voters. Indeed, a respondent in Frank Luntz's focus group said they preferred Obama because of his focus on middle class issues. 10:51 - Marcus Baram: Looks like The Associated Press reached Joe the Plumber, er, Joe Wurzelbacher, who lives near Toledo, Ohio. He did not say who he was voting for, but did say he was surprised that he was called "Joe the Plumber" repeatedly during the debate. "It's pretty surreal, man, my name being mentioned in a presidential campaign," he is quoted as saying. 10:42 - Sam Stein: The entire Frank Luntz focus group on Fox News, which is staged tonight in Miami, says that Barack Obama won the debate. Luntz defines it as a "clear majority" but not one person raised their hand when asked if they thought McCain won. On respondent says she appreciated Obama's focus on the middle class. Another said that while McCain scored some points: "I'm not voting for the great debater I am voting for the president." The best news of all for Democrats: "None [of the focus group participants] had made a decision to support Sen. Obama before the debate, but more than half supported after the debate," Luntz said. "It was a good night for Barack Obama." 10:27 - Marcus Baram: David Gergen, veteran of Republican and Democratic administrations, put it succinctly just now on CNN: McCain "looked angry. It was an exercise in anger management up there." Later, Gergen remarked on McCain's visible contempt for Obama: "There were times he brought back memories of Bob Dole in 1996" and "the looks and the disdain and the contempt and the anger that he felt was palpable." 10:34 - Marcus Baram: How times have changed. Tonight, McCain tried to distance himself from President Bush by saying, "We cannot be satisfied with what we've been doing the last eight years." Just over a month ago, at the Republican convention, McCain praised Bush, saying "I'm grateful to the President for leading us in those dark days following the worst attack on American soil in our history, and keeping us safe from another attack many thought was inevitable." "I salute his determination to make this world a better, safer, freer place," McCain told the. "He has not wavered. He has not flinched from the hard choices. He will not yield. And neither will we." "We came into the debate with two thirds of the American people thinking that John McCain is running a negative campaign, and Senator McCain spent 90 minutes trying to convince the other third. Once again, Barack Obama won a clear victory because he made the case for change for the middle class, while John McCain just had angry and negative attacks. Barack Obama showed the steady leadership that the American people need, and offered specific plans on the issues that matter to the middle class - creating jobs, cutting health care costs, building a new energy policy, and getting our economy moving. Senator McCain said that George Bush isn't on the ballot, but he couldn't name a single way that his economic policies will be any different. This was John McCain's last chance for a game-changer, and he didn't get it," said Obama-Biden campaign manager David Plouffe." And McCain spokesperson Jill Hazelbaker's take: McCain wins. "John McCain won tonight's debate with strong, clear straight talk about setting a new direction for our country and fighting for working families. He outlined a specific, bold plan for creating jobs, helping those near retirement, keeping people in their homes, curbing spending, lowering health care costs and achieving energy independence. He vowed to fight for 'Joe the Plumber' every day he is President and he affirmed his belief that we shouldn't raise taxes just to 'spread the wealth.' While Barack Obama is measuring the drapes and campaigning against a man not even on the ballot, John McCain demonstrated that he has the experience, judgment, independence and courage to fight for every American," Hazelbaker said. For eight U.S. presidential elections during the period 1960-2004, the rapid blinker during debates received fewer overall votes than his opponent. In seven of these eight elections, the rapid blinker also lost the electoral vote and was defeated at the polls. 10:25 - Sam Stein: The policy debates tonight are being connected by clear threads. Not to oversimplify: McCain is hitting the need for transparency, budget cuts and efficiencies in most programs, while Obama sees the credence of government involvement especially when it engineers reform. It comes up during the education portion of the debate. "I don't think America's youth are our interest groups," says Obama. "I think they are our future." McCain responds by touting his support for vouchers and noting that he wanted to streamline the Head Start program but Democrats wouldn't stand for it. "We need to reform these programs," he says. "We need to have transparency. We need to have rewards." 10:20 - Jason Linkins: Let me ask you: Can you remember a debate in which some moderator did not bring up poor math/science scores? Schieffer says the problem is an "obvious" one. Seems to me that it's not, considering that it keeps coming up, again and again. Here's the truth: America is best in the world at education the students that America WANTS to educate. When you exclude the children that no one cares about educating, U.S. scores exceed the world by every measure. Now, who are the kids that no one wants to educate? Well, I'll put it this way: there's a reason that hearing John McCain call education a "civil rights issue" sets my hypocrisy alarm off. 10:19 - Sam Stein: In what started out looking like a heated exchange on education, the two candidates gradually track back to each other, with each expressing support for adoption and sadness or disdain for abortion. "This is an issues that, look, it divides us and in some ways it may be difficult to reconcile the two views," says Obama. "But we should come together and say we should try and prevent unwanted pregnancies." He adds: "Nobody is pro abortion." But then he hits some of the same notes, mainly the importance of adoption and decreasing abortion procedures. "Cindy and I are adopted parents," he says. "We will do everything we can to improve adoptions in this country but that does not mean we will cease to prevent the rights of the unborn in this country." 10:17 - Nick Graham: Uncommitted Ohio voters pushed Obama to the ceiling again on CNN's debate dial when Obama spoke about coming together to reduce the number of abortions. 10:14 - Sam Stein: The two get into a debate over what kind of Supreme Court justices they would appoint. Both say they won't have a litmus test. But Obama uses the occasion to hit McCain over equal pay. "When [Lilly Ledbetter] brought a suit saying equal pay for equal work, the justices said it has taken you too long to bring this lawsuit," he said, adding that he opposed the decision while John McCain supported it. "The court has to stand up if nobody else will," he argues. "Those are the type of justices I will promote." 10:11 - Jason Linkins: It's just wrong to suggest that the Democrats blocking those judicial nominations were "unprecedented." During the Clinton years, the GOP waged a scorched earth campaign against his judicial appointments. But, whatever: McCain says he opposed litmus tests. Then he says that an essential qualification of any SCOTUS judge would be agreeing that Roe should be overturned. THIS IS A LITMUS TEST. That leaves the door open for Obama to say, "Okay, well I think supporting Roe is an essential qualification!" Which he does. 10:12 - Seth Colter Walls: When is a litmus test not a litmus test? McCain says support for Roe v. Wade is not a "qualification" that would sway his selection of future Supreme Court judges. But he's said more than that in the past. "If I am fortunate enough to be elected as the next President of the United States, I pledge to you to be a loyal and unswerving friend of the right to life movement." -- John McCain's statement to the Right To Life March in Washington in January 2008. 10:10 - Sam Stein: McCain accuses Obama of voting against Republican justices, because, he argues, it is a presidential prerogative as to who is appointed to the bench. He then slips up and claims that Obama "voted against Justice Breyer and Justice Roberts." Obama was not in the Senate during Breyer's confirmation, which took place during the Clinton administration. He meant Alito. 10:07 - Sam Stein: CULTURE ISSUE SEGMENT!!!! Somewhere, Rush Limbaugh is smiling. 10:03 - Sam Stein: Oh dear god. We are treading on soon-to-be-parodied territory here, with McCain's almost constant mentioning of Joe the Plumber. Now he is tying him into Obama's health care plan. "Joe, Senator Obama's plan... If you are out there my friend and you have got employees and you got kids, if you don't get a health care plan that Sen. Obama mandates, he is going to fine you." Obama corrects McCain, and even addresses Joe himself. "Here's your fine -- zero," he says, holding up his finger and thumb in an 'o'. "We give you a 50 percent credit for providing health insurance for his employees." Obama then rips McCain for proposing to tax the health care benefits individuals will receive from their employer - a winner for him in past debates. 9:57 - Marcus Baram: Ah, the return of John McCain's legendary sarcasm and wicked wit. His comment that he "admires Senator Obama's eloquence" about trade agreements recalled the testy exchange of letters in 2006 between the Senators when McCain wrote a nasty letter to Obama regarding Congressional efforts towards bipartisan lobbying reform. I failed to interpret your previous assurances as typical rhetorical gloss routinely used in politics to make self-interested partisan posturing appear more noble. Again, sorry for the confusion, but please be assured I won't make the same mistake again. 9:55 - Nick Graham: For the first time tonight, one of the candidates has hit the ceiling on the dial wielded by uncommitted voters in Ohio, and it was Obama while discussing the need to develop more fuel-efficient cars and other ways to make America energy independent. 9:52 - Sam Stein: The disdain for Obama is nearly dripping from McCain's mouth. "I admire so much Sen. Obama's eloquence," he says, "and you really have to pay attention to words. He said we can 'look at' offshore drilling. You got that? 'Look at.' We need to do it now." He then criticizes Obama for never traveling to the southern hemisphere as a reason why he doesn't support the Colombia Free Trade Agreement. "Maybe you ought to travel down there and visit them and maybe you can understand them a lot better," he says, disregarding the fact that his running mate has only been to two other countries and just recently got her passport. 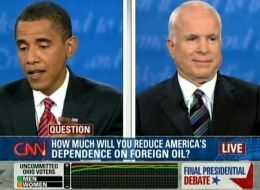 As Obama gives his response, McCain rolls his eyes dramatically. 9:49 - Jason Linkins: You know, McCain keeps calling Biden's partition idea "cockamamie," but one thing that he doesn't have any answer for is the fact that Kurdistan is, more or less, an independent state. They aren't going to curb their ambitions for the sake of the Sunnis and Shia, and they certainly aren't going to give anyone in the region a veto over their survival. While the Iraqi government dithers, endlessly, on oil agreements, Hunt Oil - whose chairman, Lamar Hunt, has a seat at the table in the White House - have gone around all the process to negotiate their own deal. And the Kurds have put down their marker in oil-rich Kirkuk - if they can't get that oil through a vote, they'll get it through war. Ask McCain what he's going to do about bringing the Kurds home. He won't have an answer. Beyond all that: McCain is one to talk about Biden's foreign policy mistakes. This is the guy who said we'd be greeted as liberators, said that the war in Iraq is one of the "best things to happen to America," who has struggled with the basics of the conflict (who are the Shia? Who are the Sunni? Where is Joe Lieberman, to tell me the answer?). He called the insurgency an "overrated threat," and now insists that the "Surge" - a response to that "overrated threat" - is the greatest military offensive in the history of America. He insisted that we'd pay for the war with Iraqi oil - Iraq has the money, and they're not exactly prepping a bailout package for us. 9:47 - Sam Stein: Energy independence has been one of the best issues for candidates to discuss in these debates. And when McCain discusses the need to explore all options the crowd responds with high accolades. It raises a question: could the McCain campaign have done a better job tying energy independence into this economic crisis? It could have been a boon for them in a way that health care and social security have been for Obama. John McCain touts his running mate Sarah Palin as a reformer and, specifically, for her understanding of special needs children, primarily because she is the mother of one. Obama commends his opposition on this front but then adds: "I do want to just point out that autism, for example, will require some additional funding if we are going to get serious in terms of research... and if we have an across the board spending freeze we are not going to be able to do it." The question arises: who would be better on the issue? Palin, because she has lived it, or Obama, because he wants money to explore it? McCain responds by hitting Obama for wanting more money to do everything. "Why do we always need to spend more?" he asks. "Why can't we have transparency and accountability?" 9:41 - Marcus Baram: When McCain pivoted from his Ayers attack to say "My campaign is about getting this economy back on track," Obama couldn't help but laugh. 9:40 - Jason Linkins: McCain's gone all in on Bill Ayers and ACORN. He says of ACORN that they are "perpetrating a massive fraud," and "destroying the fabric of our democracy." THEY ARE TEARING A HOLE IN THE SPACE-TIME CONTINUUM! They have gone back in time to give Benedict Arnold rocket-propelled grenades! WALK OUTSIDE PEOPLE! We are subjects of the Queen of England! In truth, the only voter fraud I see in this whole ACORN mess is fraud perpetrated against ACORN by its own employees. 9:39 - Seth Colter Walls: Both men and women disapprove on CNN's dials during McCain's extended hit on Ayers saying he didn't "bomb enough" in 2001. 9:39 - Sam Stein: McCain goes where he hasn't before in a debate format: Bill Ayers. "We need to know the full extent of that relationship," he declares. Then he accuses the community organizing group ACORN of committing, potentially, "one of the greatest frauds of voter history in this country, maybe destroying the fabric of democracy in this country." It is a wild accusation, not grounded in any bit of reality. Just asked Florida Gov. and McCain surrogate Charlie Christ, who says the allegation is being overblown. Obama responds by explaining his relationship with Ayers: "Bill Ayers is a professor of education in Chicago, 40 years ago when I was eight years old he engaged in despicable acts with a domestic group. I have roundly denounced those attacks. Ten years ago he and I served on a school board funded by one of Ronald Reagan's close friends. "The fact that this has become such an important part of your campaign," he concludes, "says more about your campaign than it does me." 9:36 - Marcus Baram: It's getting nasty and it will remain so. So far, the lengthiest response to any of Schieffer's questions so far has been to his question about whether the candidates were "willing to sit at this table and say to each other's face what you have said" in recent weeks, from McCain's ads saying that Obama is dangerous and "palled around with terrorists" and comments by Obama aides describing McCain as erratic and "out of touch." In a heated and sometimes childish exchange over who is responsible for negative attacks, McCain claimed three times that Obama has spent an "unprecedented amount of money on negative ads" and Obama vigorously protested the comments made by McCain supporters, from "Terrorist" and "Kill him!" at the candidate's rallies. McCain strongly defended his supporters, saying "I am proud of the people who come to our rallies... You're always going to have some fringe people." He went on to criticize Obama for implying that "some of the most dedicated patriotic men and women," including military wives and veterans, were among those screaming such comments. 9:35 - Sam Stein: Both candidates suffer on the Ohio uncommitted meter when they get into the back and forth over attacks. But, it should be noted, when Obama complains that this is distracting from the debate on larger issue, the voters respond much more positively. 9:31 - Sam Stein: Sen. McCain acknowledges that "this has been a tough campaign," but then he goes off on an oft-repeated and a completely random tangent. First he blames Obama for causing the mess by not "keeping his word" on town hall meetings. Then, asked to say what he regrets, he only site something Obama's surrogate, Rep. John Lewis, recently made: "I regret some of the negative aspects of some of these campaign. The fact is it has taken many turns that I think have been disrespectful... Congressman Lewis, made allegations that Sen Palin and I were somehow associated with one of the worst chapter in American history." He then accuses Obama of not repudiating the remark, which Obama did... partially. Obama, after reminding McCain that all polls show he is running the more negative campaign and that McCain is running 100 percent negative ads, puts himself above the fray. "I think the American people are less interested in our hurt feelings than they are in the issues... The notion that because we are not doing the meetings justifies some of the ads going on... I don't mind being attacked for the next three weeks, what the American people can't afford is four more years of failed economic policies." 9:28 - Seth Colter Walls: McCain sounds very credibly emotional as he distorts Congressman John Lewis's statements. To wit, Lewis did not say McCain and Palin were "associated" with the "worst chapter in American history." Rather, Lewis simply pointed out that politicians do not have to explicitly advocate violence in order to sow "the seeds of hatred and division." Meanwhile, McCain steers completely clear of Bill Ayers when given the chance by Schieffer to say in public what his surrogates say on cable news shows: that Obama has to further explain his "tied" to the domestic terrorist. 9:27 - Jason Linkins: By the way, I guess Barack Obama is aware that his smack at Fox News is an out-of-the-bag cat, because tonight, he got a little quippy, pressing McCain on a point on policy that "even Fox News disputes it, and that doesn't happen very often." 9:26 - Jason Linkins: FALSE EQUIVALENCY COMING. Obama calling McCain "erratic" is the same as saying someone "pals around with terrorists." And Schieffer uses, "Say it to his face." McCain, though, continues to stipulate that all of the negativity happened as a direct result of not doing town hall meetings! Good Lord! Is he never going to let that go? 9:23 - Sam Stein: When McCain attacks Obama on the topic of budgets, accusing the Illinois Democrat of supporting out of control spending, the response among Ohio uncommitted voters is decidedly split. Women don't like it. Men love it. 9:18 - Sam Stein: McCain, asked what programs he would cut, decides instead to talk about home ownership. In the process, he references programs enacted in the 1930s. "During the Great Depression we had a thing called the home ownership loan corporation," he starts before Bob Schieffer cuts him off. Bringing up the Great Depression may not be the best tactic in this case, both because it brings up questions of McCain's age and reminds people just how awful the economy currently is. 9:15 - Seth Colter Walls: Hoover comparison watch: A Democrat emails over the following quote from the much-maligned president who oversaw the start of the Great Depression. "No matter how devised, an increase in taxes in the end falls on workers and farmers, or alternatively deprives industry of just that much ability to give employment and defeats the very purpose of these schemes." Sound at all like McCain saying all new taxes end up hurting job growth? Sam Stein: McCain is hammering Obama on taxes and wanting to spread the wealth around: "why in this economy would you want to raise taxes?" Obama says, at one point, that he personally would spend a bit more if it meant tax breaks for other. Usually, in these scenarios, Obama brings up McCain's health care plan, which he argues would tax benefits for the first time in history. But the debate contours prevent the conversation from going there. 9:14 - Seth Colter Walls: According to CNN's undecided voter dials in Ohio, Obama is struggling for liftoff with his explanation of his dialogue with "Joe the plumber." Meanwhile, McCain is winning by repeatedly hitting the "spread the wealth" comment. Jason Linkins: McCain is going to press that point. "CLASS WARFARE." And Obama is talking about Warren Buffet, and Exxon/Mobil. At the same time, I'm not sure any of this matters. In this economy, people want the wealth spread around to them. They can go back to getting fondled by Adam Smith's invisible hands a decade from now. 9:13 - Sam Stein: McCain brings up a tale form the trail of an Ohio man who approached Obama about his individual business, which will be taxed at a higher bracket because he makes more than $250,000 a year. "Joe," McCain says to the camera, addressing the plumber from Ohio. "I want to tell you I will not only help you buy that business that you have worked your whole life for... and I will not have or stand for a tax increase on small business income... What you want to do to Joe the Plumber... is have their taxes increase." McCain later accuses Obama of wantng to redistribute wealth - a charge the McCain folks have been pushing for weeks. Obama responds to the charge by accusing McCain of "watching some ads of Sen. McCain's." He notes that 95 percent of working families will get a tax cut and that 98 percent of small businesses make less than $250,000. "The conversation I had with Joe was that five years ago when you were in position to buy your business you needed a tax cut then... I want to make sure that those people get a tax break now." 9:11 - Jason Linkins: Unfortunately, Obama's making the mistake of wandering away from the subject of the question. He should be answering this question in terms of, "Here's what I'm going to do for Joe the Plumber." He needs to demonstrate how wealth comes home to Joe. Nico Pitney: From a reporter, via email: "Am I the only person who kinda resents being overcharged by plumbers?" 9:08 - Sam Stein: Four times in the first thirty seconds of his opening remarks, McCain says Americans are "angry." He is hitting a populist tone early on, and pivots from there to discuss his new home ownership resurgence plan, which takes money from the bailout to buy people's mortgages at face value and renegotiate them. Not to be upstaged, Obama rails against corporate CEO pay and declares: "What we haven't yet seen is a rescue package for the middle class because the fundamentals of the economy were weak even before this crisis." He then takes a dig at McCain's plan: "I agree with your idea that we have to help home owners," he says. "I disagree with Sen. McCain in how to do it, because the way Sen. McCain has designed his plan it could be a giveaway to banks." Seth Colter Walls: First one of these from Obama: "I agree with Senator McCain" on supporting homeowners. Much was made of this type of agreement during the first debate. We saw less of it during the second debate. Look to see the McCain camp make some hay out of this. 9:07 - Jason Linkins: Obama goes right to nuts and bolts, and the dial meter only dips when Obama suggests that he agrees with McCain. 9:06 - Seth Colter Walls: Obama looking straight at the camera -- and the viewers at home -- during his first response, unlike McCain. 9:03 - Jason Linkins: McCain says that Americans are "hurt and angry." Also: "hurt and angry." Now, after introducing, broadly, a case against Wall Street greed, and Washington incompetence, he jumps into blaming "Fannie and Freddie Mae" who apparently just got a subprime marriage, with Freddie Mac taking Fannie's first name. Ultimately, however, you cannot base an economic plan solely on Fannie/Freddie reform. But you can, I suppose, advance the nutlog Fannie/Freddie/Acorn/Obama conspiracy theory. 8:59 - Sam Stein: Something of a preview of tonight's debate is offered by McCain spokesman Brian Rogers who - in addition to some colorful language about press strategy - suggests that associations (i.e. Bill Ayers) will be discussed. "Hello from the McCain-Palin war room at the final debate at Hofstra University in Hempstead, New York," he writes. "[Fellow spokersperson] Pounder is wearing a green fleece vest tonight, so you know it's time to rumble. We'll be raining truth down on your inbox again this evening, but please check Goldfarb at the McCain Report for those comments not suitable for mass-emailing. "As for the debate, here's what to watch for: Whether it is his questionable associations, his record (or John McCain) and his policy proposals, Barack Obama has not been honest and straightforward with the American people." OCT 15 -- Palin Prods McCain To Get In Obama's Face: Ever the attack dog for the McCain campaign, Sarah Palin is "prodding John McCain to be more agressive with Barack Obama," reports ABC News. "Barack Obama even has called John McCain out on this saying, "Hey, if you've got something to say, say it to my face in a debate," Palin told WMUR in New Hampshire today. "So we'll see tonight if John McCain does that," added Palin, practically daring her running mate to go on the attack. Obama Camp Confident: Senior strategist David Axelrod tells reporters that Obama's campaign is "not in the business of reinventing ourselves from debate to debate" while they expect to see yet another version of their opponent -- "McCain 7.0." He also said Obama has "learned that [McCain] doesn't like to look at him very often. I don't think it's of that much consequence" to Obama but "obviously it was noted." Axelrod also denied that Obama's campaign had goaded McCain into bringing up Bill Ayers, saying that such attacks "are not what the American people want to hear." What To Expect: Both candidates will strive to project the image of a strong and steady leader who can steer the country through troubled economic times. The pressure is on for John McCain, who keeps sliding in the polls, and he previewed a possible debate strategy at rallies in Pennsylvania on Tuesday: "argue that he would be different from Bush and better than Obama," reports the AP. Honoring the pre-debate tradition, Barack Obama's campaign is out with a memo on Wednesday raising the expectations for John McCain to ungodly heights. But in addition to setting the stage for tonight's affair, the Illinois Democrat did something peculiar: he allowed a peek into internal strategy. Spokesman Bill Burton lays out -- in no small measure -- how he believes the debate will precede. "Just this weekend, John McCain vowed to 'whip Obama's you-know-what' at the debate," he writes, "and he's indicated that he'll use Bill Ayers to attack Barack Obama... Senator Obama is going to use the debate to discuss his plan for the economy. That's what he's been doing this entire campaign." Such a prediction may seem, at once, over-simplistic and optimistic. But the Obama campaign has been engineering this scenario for the past week. Indeed, if John McCain brings up Ayers in tonight it may be because he was goaded into doing so. With his supporters chanting "take the gloves off," John McCain has indicated he will do just that in the final presidential debate before Election Day. "I want to do about half as good as Sarah did against poor old Joe Biden,' McCain told a group of fundraisers last night. While the economy is the pressing issue on the minds of most voters, character issues could bubble to the top of the debate. "Sen. Obama has had relations with ACORN in the past," McCain told a local Florida television station yesterday, referring to the Democratic voter registration organization. "Those, like his relations with William Ayers and others, need to be, Americans need to be fully informed." OCT 14 -- McCain Plans To Bring Up Ayers: The Republican candidate says he will probably talk about former Weather Underground member Bill Ayers at the final debate -- and that Barack Obama is making him do it. Quinnipiac pollster Peter Brown looks at new numbers out of battleground states and declares that McCain needs a "knockout" in the final debate to come from behind. [U]nlike at the other two debates, the candidates will sit at a table facing one another. CBS News' Bob Schieffer, host of "Face the Nation," will moderate the debate and told The Associated Press on Sunday that he will be seeking more on what each will bring to the presidency. "By now, we've all heard their talking points," he said. "We've heard the general outlines of what they are talking about. The time has come to be a little more specific." "It will not embarrass me, if they go off in a different direction, to say, 'excuse me, could you focus on the question that I just asked?' " he said. OCT 12 -- McCain Promises To "Whip" Obama In Final Debate: The Arizona Senator says he will "whip" Obama's "you-know-what" on Wednesday. Obama prepared for the debate in Ohio, where he says a discussion of tax policy with a voter gave him "some pretty good practice."